Modern-era recessions in the U.S. have generally been less severe than those of the 19th and early 20th centuries. But this one stands out for two features that, taken together, validate its by-now-familiar designation as the worst recession since the Great Depression. The Surge in Long-term Unemployment: The typical unemployed worker today has been out of work for nearly six months (23.2 weeks). 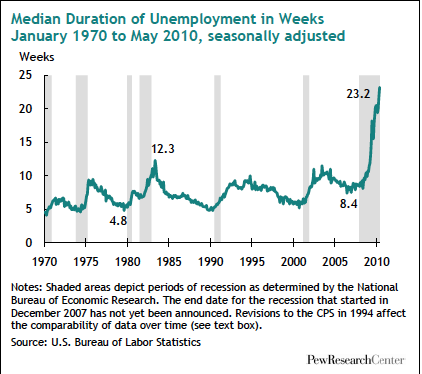 This is almost double the previous post-World War II peak for this measure—12.3 weeks—in 1982-83. Long-term unemployment of this magnitude and duration raises a vexing question: Beyond a “normal” cyclical downturn, might the U.S. economy be going through some long-term structural changes that will lead to relatively high rates of unemployment for years to come? The Meltdown in Household Wealth: This recession has eroded more household wealth than any other episode in the post-World War II era—not surprising in that it was triggered by the bursting of bubbles in both the housing and stock markets, the two principal sources of household wealth. According to the Panel Survey of Income Dynamics (PSID) 3 , median household wealth decreased by an estimated 19% from 2007 to 2009. On a percentage basis, this loss of wealth was greater among middle-income households than among those in either the lower or upper income tiers. Similarly, it took a much bigger percentage bite out of the (relatively modest) wealth of black and Hispanic households than of white households. 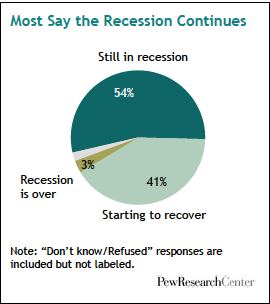 rt that the recession is already over—and has been for some time. But with the nation’s overall unemployment rate remaining stubbornly high—9.7% as of May 2010—the quasi-official arbiters of the nation’s business cycles at the National Bureau of Economic Research4. The NBER is a private, not-for-profit economic research organization based in Cambridge, Mass. It counts more than 1,000 professors of economics among its research associates. Since forming its Business Cycle Dating Committee in 1978, it has been the quasi-official arbiter of the timing of expansions and recessions in the U.S. economy.] (NBER) have yet to declare that it is over. To further complicate matters, this doesn’t necessarily mean it isn‘t over. 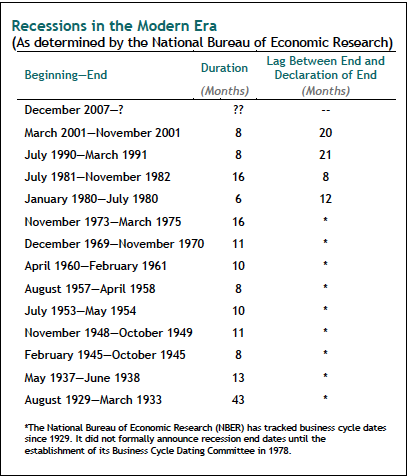 Because of the way the NBER operates, there is often a lag time of a year or more between its declaration of the end of a recession and the date that recession is retrospectively said to have ended. (For details, see Chapter 2).